Are you BoHo? Or would that be “Do you BoHo?” BoHo-ness? BoHo-y? I don’t know… anyway… If you like BoHo… then you need to get over to the BoHo Culture Fair quick as you can! Most Designers have set out 1L or completely free gifts, there are Gachas and every Designer has a Fair exclusive item! Several designers have provided free group gifts (Including one for the GUYS) for the fair as well. 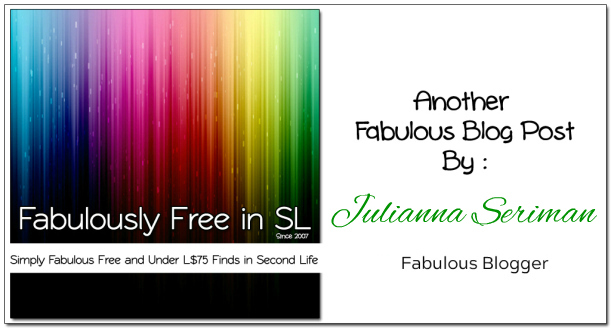 One of my favorites, Monomania, has set out a lovely FabFree Group Gift for us, Love showed us here. Just wear your FabFree Group tag and grab it! Monomania has also set out a 1L gift at their booth for everyone. You can grab this sweet little ‘Zen Top’ for just 1 little Linden. The fit is erfect and I love the soft floral fabric. It’s funky but not too “Hippie” to wear just about anywhere. I also found my lovely new necklace at the Fair from Petite Mort. This is ‘MoonMaiden’ and it’s the 1L gift set out for us. The necklace is completely adjustable so you can get your fit. Gypsy Chic has set out the perfect flower child gift for us too. My crown of roses is the ‘Flower Crown’ and it’s a 1L gift too. The crown comes with a HUD for lots of color choices to suit your mood. You only have TWO MORE DAYS to visit the Fair so get going! Your Taxi – Is Here! Categories: accessories, dollarbie (1L-3L), events, FabFree Group Gifts, Free, gacha, group gifts, jewelry, mesh, shirt, Uncategorized | Tags: Boho, Boho Culture Fair, dollarbie, fab free, Fab Free in SL, fabfree, fabfree in sl, fabulously free in SL, fashion, gift, Gypsy Chic, Ikon, Juli, Julianna Seriman, La Petite Morte, lelutka, maitreya, Maitreya Lara, MONOMANIA, pout!, Second Life, SLink, The Looking Glass, TRUTH | Permalink.